"South American and South African Tour 2012"
The Living Things South American and South African Tours (condensed to one page due to the small number of shows) were two tours composed of 5 and 2 shows each in October and November 2012. 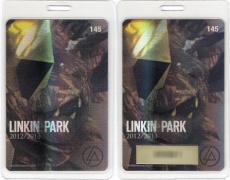 This was Linkin Park's third trip to South America after visits in 2004 and 2010. Buenos Aires, Argentina was the first stop of the tour and hosted Linkin Park for the second consecutive visit - almost two years after their first visit to Buenos Aires. October 11: Porto Alegre, Brazil - Zequinha Stadium"
On September 10, 2010 the tour was rescheduled. "Due to logistical issues, some changes have been made to Linkin Park's upcoming Brazilian tour. Because of these changes, the concert scheduled in Curitiba on October 10 unfortunately had to be cancelled." While Curitiba did not receive a show, Rio de Janiero was able to host two intimate shows for fans. 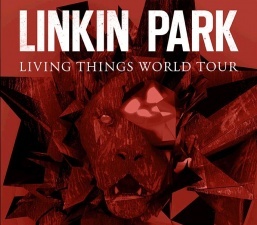 After this tour, Linkin Park visited South Africa for two stadium shows, headlining Cape Town Stadium in Cape Town and FNB Stadium in Johannesburg. This was the first Linkin Park visit to South Africa. The 7th LPU Summit was held in Cape Town on November 7th. For the Summit, the band performed a seven song soundcheck before the show. A number of fans were injured before the show when scaffolding outside the venue fell on them due to the high winds. One fan died as a result and a number of others were hospitalized. Mike addressed the accident at the following show in Johannesburg. At the Johannesburg show, Linkin Park performed for over 65,300 people. For the South American shows, the band utilized Sets A, B, and C from Honda Civic Tour. Night two in Rio de Janeiro was the last time Set C (opening with With You and including When They Come For Me) was performed on the Living Things World Tour, as it did not make it to South Africa or into 2013 for any shows. South Africa utilized Sets A and B. In Buenos Aires, New Divide was aborted right before the breakdown due to the crowd being rowdy. Chester sang part of it acapella after that then gave a speech to the crowd: "If someone falls down, pick 'em up!" Then the band played With You. Fans flashmobbed the band on Lost In The Echo by holding up signs that referenced the music video for the song as well as pictures of themselves. Phrases on the signs included "GET LOST" (the most common phrase), "THIS TIME I FINALLY LET YOU GO", "I DON'T BACK UP I DON'T BACK DOWN", "EACH WORD GETS LOST IN THE ECHO", "LET THE BELLS RING WHEREVER THEY ARE" and "WON'T FORGET HOW I GOT THIS FAR". At night one in Rio de Janeiro, Chester sang the first verse of Crawling acapella for the crowd, who had been chanting for it throughout the show. Linkin Park performed three more times in 2012 after the visit to South Africa. On November 18th, the band played at the American Music Awards in Los Angeles, performing Burn It Down between Taylor Swift and Nicki Minaj. On December 7th, Linkin Park debuted Castle Of Glass at VGA 10 in Culver City, CA. The next day, they headlined the KROQ Almost Acoustic X-Mas in Universal City, CA, their sixth time playing the annual show (2000, twice in 2001, 2003, 2007 and 2012). They played an abbreviated 14 song setlist, including opening with Lost In The Echo for the only time in the song's live history. Castle Of Glass made its appearance in the middle of the setlist, where it would stay for 2013. This page was last edited on 20 October 2016, at 16:08.